IRVINE, CA--(Marketwire - February 2, 2010) - In organizations of all sizes, data storage is a primary factor driving operating costs, and entrenched at the top of the list of storage challenges is data protection. With less storage expertise and tighter budgets than their large enterprise counterparts, small and medium businesses are particularly struggling to simplify their backup processes in a way that's efficient and cost effective. In the realm of enterprises, CIOs and other IT executives have sought to conserve budgets and resources during the economic downturn, and server virtualization has become an increasingly attractive option, offering benefits such as optimum resource utilization, reduction in hardware expenses, lower energy consumption, and the ability to reallocate IT personnel. Fewer servers also require less maintenance, thus further reducing IT infrastructure costs. While the virtualization of systems and storage has many upsides, it can also lead to resource redirection that can obscure and complicate important IT operations. Particularly vulnerable is file-level data protection, which has the ability to turn the efficiency found in virtualization into a compliance and regulatory nightmare if critical business data has not been properly secured or backed up. To address the issue of data protection, Paragon Software Group, the technology leader in innovative data security and data management solutions, has created Drive Backup 10 Server, which offers disaster recovery and system migration in both physical and virtual environments. Drive Backup 10 Server creates an exact copy of a live disk drive on servers or workstations, including the operating system, all files, programs, updates, and databases -- and includes Adaptive Restore, which gives the ability to restore to different hardware. A recently-published analysis report by openBench Labs details the benefits offered by Paragon's Drive Backup 10 Server. 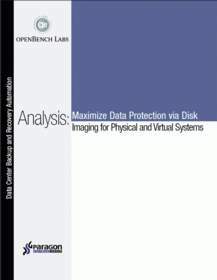 The lab performed rigorous hands-on tests using virtual machines, virtual tapes and synthetic backups with detailed data protection scenarios. The analysis examines the advanced features of Paragon Drive Backup 10 Server, including the ability to inject drivers into bootable images to enable fast physical-to-virtual and virtual-to-physical system migrations, and also offers a comparison to an alternative approach. According to Jack Fegreus, Ph.D., managing director of openBench Labs, "Our tests of Paragon's Drive Backup 10 Server confirmed the product's ability to rapidly improve the productivity of administrators, increase storage capacity, supply more efficient and faster backups, and provide a quantifiable savings in storage resources. Moreover, IT administrators do not have to purchase extra-cost options to leverage the power of Drive Backup 10 Server in a virtual environment. Using the archive view of the main interface, they can easily launch and customize sophisticated backup processes for a virtual machine as easily as a physical system." Unlike other products in the market, Drive Backup 10 Server goes far beyond simply recovering files or drive images from a single backup process; it can mount a full or synthetic backup of a virtual disk volume from which files can be copied at will without going through a restore process. IT administrators can then use the backed-up images to test and debug versions of software before introducing them into a production environment. "Full recovery time using Paragon's Drive Backup 10 Server can be measured in minutes," said Tom Fedro, president of Paragon Software Group. "Drive Backup 10 Server is very easy to deploy and reduces storage costs as it increases the reliability and availability of a VMware or a Microsoft® Hyper-V environment." To download the openBench Labs white paper, please visit http://bit.ly/virtual-server-backup. Paragon Software Group is an innovative software developer focused on two dynamic growth markets. The company's comprehensive product line for the data storage market addresses the needs of data security, storage and management for PCs, servers and networks. A second portfolio of products focuses on mobile productivity applications for handheld devices. Founded in 1994, Paragon Software has offices in the USA, Germany, Japan, and Russia delivering its solutions to consumers, small business and enterprise clients worldwide through a network of Value Added Resellers, distributors and OEMs as well as online through the company website. Paragon Software provides technology to a host of world class companies and partners including Cisco, Dell, Toshiba, NEC, Siemens, Microsoft, Motorola, Nokia, and more. For more information please visit the company website at www.paragon-software.com. A recently-published analysis report by openBench Labs details the benefits offered by Paragon's Drive Backup 10 Server, including its ability to increase storage capacity, supply more efficient backups, and provide savings in storage resources through virtualization. The analysis also examines the advanced product features and offers a comparison to an alternative approach.